Everything you need to know about how to watch Saturday's first round games for the 2016 NCAA tournament. These teams both cruised to first-round victories, setting up what should be one of the better second-round clashes. Wichita State might be the one team in the tournament that can match Miami’s senior-driven experience, and it has the defense (No. 1 in adjusted efficiency on kenpom.com) to slow down the Hurricanes (No. 12 in adjusted offensive efficiency). If Makai Mason and the Bulldogs are going to keep the upset train rolling, they’ll need to win the battle of the backboards the way they did all season in general (20th nationall in rebounds per game) and against Baylor (36-32 edge) in particular. Duke was one of the most generous defensive-rebounding teams in the country, but its offensive efficiency will be something that Yale has not seen since an 80-61 loss to the Blue Devils at Cameron Indoor Stadium back on Nov. 25. The marquee game of the second round between these border state rivals that have combined for 13 national championships should produce one of the most entertaining games of the weekend. 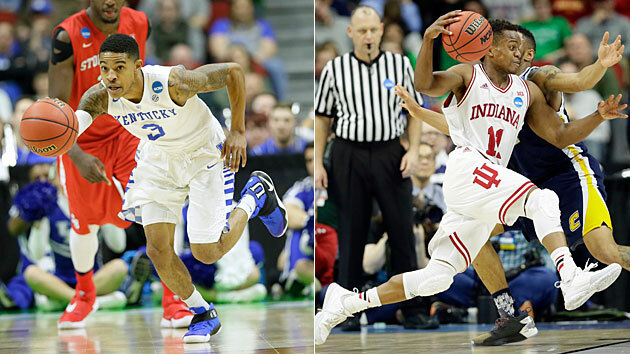 Both Kentucky and Indiana are in the top five in adjusted offensive efficiency, and both have elite guards, in Tyler Ulis and Jamal Murray for the Wildcats and Yogi Ferrell of the Hoosiers. You won’t want to miss this one. Does Josh Hagins have an encore performance ready? The Trojans pulled off a stunning comeback against Purdue in the first round, winning in double overtime thanks in part to the 31-point performance from Hagins, but the task will be tougher against a veteran Iowa State team. Point guard Monte Morris should be able to handle the on-ball pressure defense that felled the Boilermakers, and forward Geroges Niang is an established star who will be able to get his own shot at any time. Get all of Michael Beller's columns as soon as they’re published. Download the new Sports Illustrated app (iOS or Android) and personalize your experience by following your favorite teams and SI writers. Butler is no stranger to March magic, but the Bulldogs face a tall order in Malcolm Brogdon, Anthony Gill and the Cavaliers. Virginia is one of only two teams still alive in the tournament that rank in the top 10 in both adjusted offensive and defensive efficiency (the other is another No. 1 seed, Kansas). As is typically the case with the Cavaliers, if they control the tempo they will win this game. It takes just one bad game for a top seed to go home in the dance, and for the Jayhawks that game has come in the round of 32 each of the past two years. This Kansas team, however, doesn’t appear to have any holes that even a talented squad like Connecticut can readily exploit. In this instance, one of UConn’s scorers—be it Daniel Hamilton, Rodney Purvis, Shonn Miller or Sterling Gibbs—is going to have to put forth a Herculean effort if the Huskies are to advance. Jakob Poeltl vs. Domantas Sabonis is a matchup we’ll see in the NBA next season, so it will be a treat to see the sophomore stars of the Utes and Bulldogs, respectively, battle in the post in this game. One area of concern for Utah: it allows its opponents to connect on 36.8% of their three-point attempts, which ranks 286th in the country, and the Zags shoot 37.8% on the year. Do the Friars have any hope of slowing down the Tar Heels' inside game? That’ll be the only way to send the top seed in the East home, but 6'10" Brice Johnson, 6'9" Kennedy Meeks and 6'9" Isaiah Hicks will present an awfully tough matchup for a Providence team that let its opponents connect on nearly 50% of their two pointers and is merely average in defensive rebounding rate. North Carolina, meanwhile, makes 53.6% of its two-pointers (23rd-best in the country) and gets 39.7% of all available offensive rebounds (fourth-best nationally).